Please note that although there is flooding in areas that our schools are located, as of this evening, all schools will be open Wednesday, April 24th. If there are any changes due to the ongoing nature of the situation, you will be advised. Please be advised that due to the closure of the 325 (from Chemin Petit Brulé to Chemin Saint Guillaume), detour via St. George, we anticipate delays in bussing, until further notice. As a result, busses may arrive late at planned stops. Please be advised that due to the closure of roads in the Pierrefonds area, we anticipate delays in bussing. As a result, busses may arrive late at planned stops. Please be advised that due to the ongoing flooding in the Pierrefonds area, the following modifications have been made for drop-off and parking at Pierrefonds Comprehensive and West Island Career Centre, until further notice. Access to the building will only be available for cars & school busses on the west side, via the entrance on Richmond. Security personnel will be onsite to assist in directing vehicles. PCHS Parents and busses will be directed to the horseshoe driveway on Richmond. PCHS staff will also use the Richmond Entrance to access the PCHS parking lot (via the alleyway, north of the building). Parking for WICC students & staff will remain as is. Busses arrive at PCHS between 7:15- 7:20Am. We ask that parents who intend to drop off their child(ren) do so starting at 7:30AM. 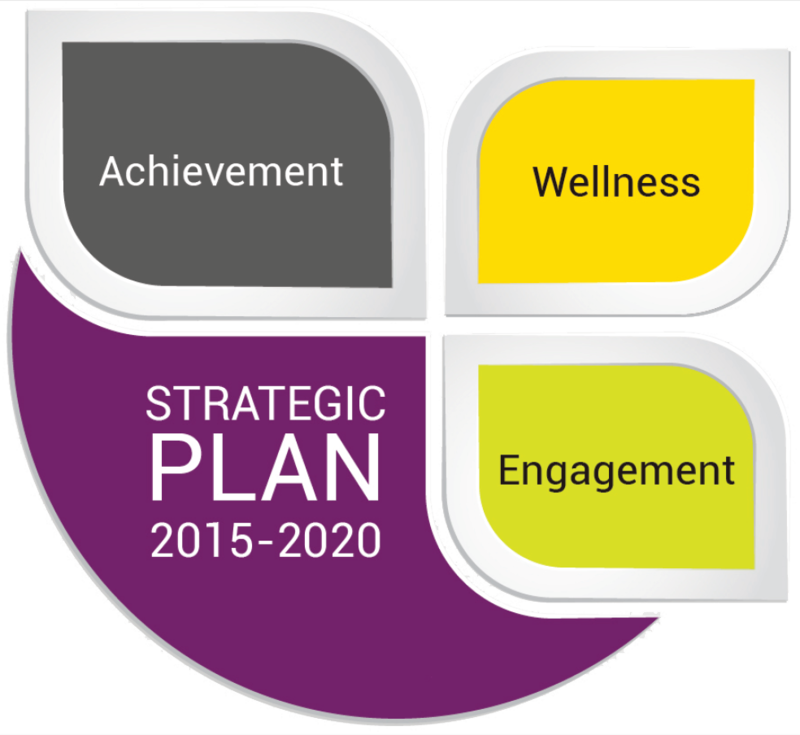 The Lester B. Pearson School Board (LBPSB) is seeking a strong educational leader with a proven track record to serve as its next Director General. 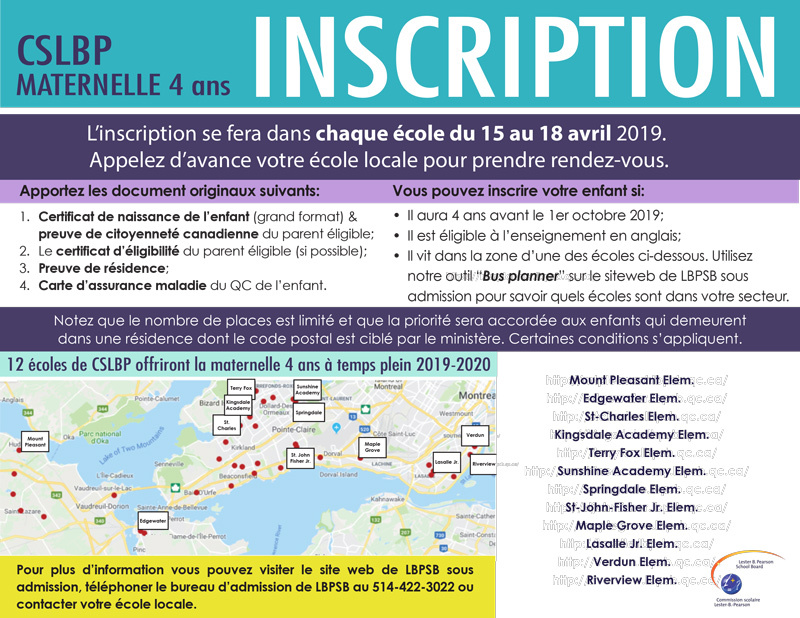 The selected candidate will be responsible for the management of activities, programs and resources of all the LBPSB schools, Continuing Education centres, administrative units, and as well as ensuring the delivery of quality services. The Director General will oversee the implementation of decisions made by the Council of Commissioners and the Executive Committee in accordance with the laws and regulations in force. 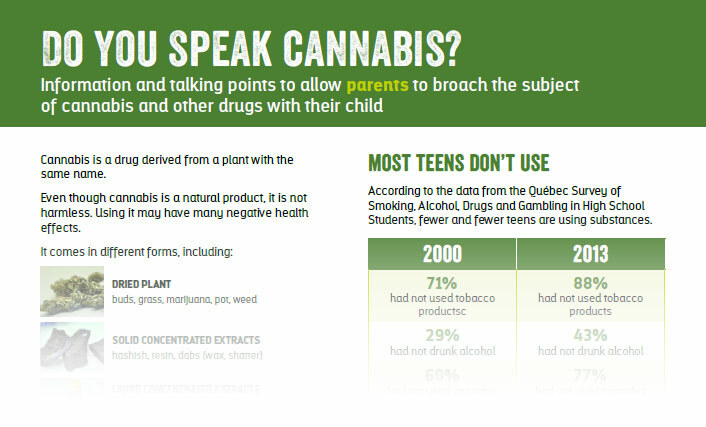 LBPSB is an acknowledged leader of innovative education in Québec, providing bilingual educational programs and services to youth and adults from Verdun through the West Island of Montreal and the mainland territory extending to the Ontario border. LBPSB services over 24 000 students in 57 schools and centres, including growing cohorts in our industry-leading international program. The board employs over 5000 full and part time employees and manages an annual budget of over $300 million. Lester B. Pearson is among the most successful school boards in Quebec, measured by the rate of our students’ successful completion of their programs. 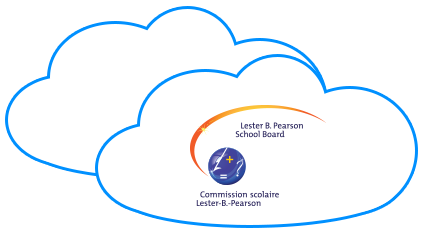 La Commission scolaire Lester-B.-Pearson (CSLBP) recherche une dirigeante ou un dirigeant chevronné en éducation possédant une expérience éprouvée pour occuper le poste de directeur général ou de directrice générale. La candidate ou le candidat choisi sera responsable de la gestion des activités, des programmes et des ressources des écoles, centres et unités administratives et assurera la prestation de services de qualité. La directrice générale ou le directeur général veillera à l’application des décisions prises par le Conseil des commissaires et le comité exécutif, conformément aux lois et règlements en vigueur. Elle sert une clientèle de plus de 24 000 élèves dans 57 écoles et centres, qui comprennent des cohortes croissantes dans notre programme international qui se classe en tête de file de l’industrie. Elle emploie plus de 5 000 employés à temps plein et à temps partiel et elle administre un budget annuel de plus de 300 millions de dollars. Elle compte parmi les commissions scolaires dont les résultats sont les plus élevés au Québec en ce qui a trait à la réussite des programmes par les élèves. Dorval, April 16, 2019 – The Council of Commissioners announces the upcoming retirement of the Lester B. Pearson’s beloved Director General, Michael Chechile, effective Tuesday, September 3, 2019. Michael Chechile was appointed Director General of the Lester B. Pearson School Board on June 8, 2015. Prior to his appointment, he served as Pedagogical Consultant, Vice-Principal, Principal, Director of Educational Services and as Senior Director of Educational Services and Technology. He was responsible for the creation of the Digital Citizenship Program - a program that served as the inspiration for the development of Quebec Ministry of Education resources related to learning in the digital age. He was responsible, as well, for bringing the first-ever Google Applications for Education Summit to Quebec. His pedagogical career has spanned 33 years. Michael’s contributions to English education in this province and beyond are truly distinguished, and his impact on teaching and learning are immeasurable. He has led by example with innovation and integrity. He has shown the way for countless colleagues, staff, teachers, school leaders and system leaders. And, he has always done so with humility, affability and a genuine skill for connecting with people and respecting where it is they sit. The Council of Commissioners will start the process of finding a new Director General in the weeks to come, with a decision expected at the June Council meeting. 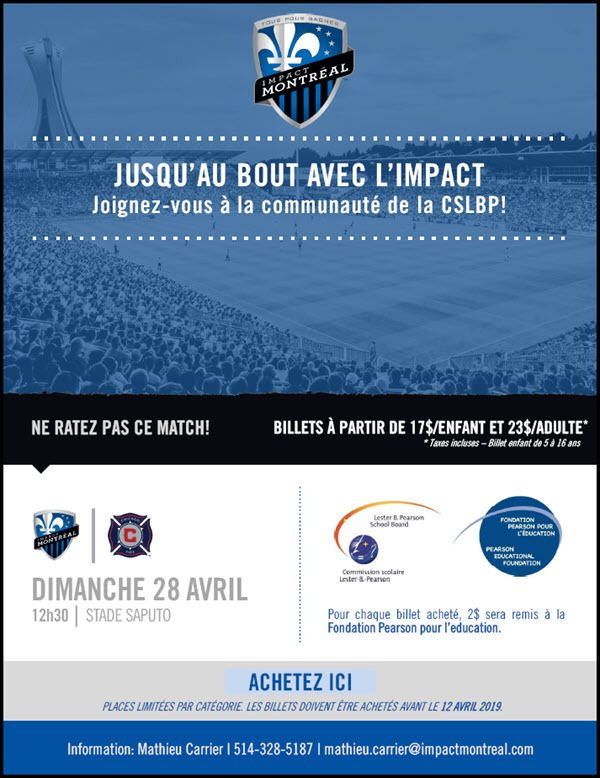 All the Way with the Impact - April 28th game! 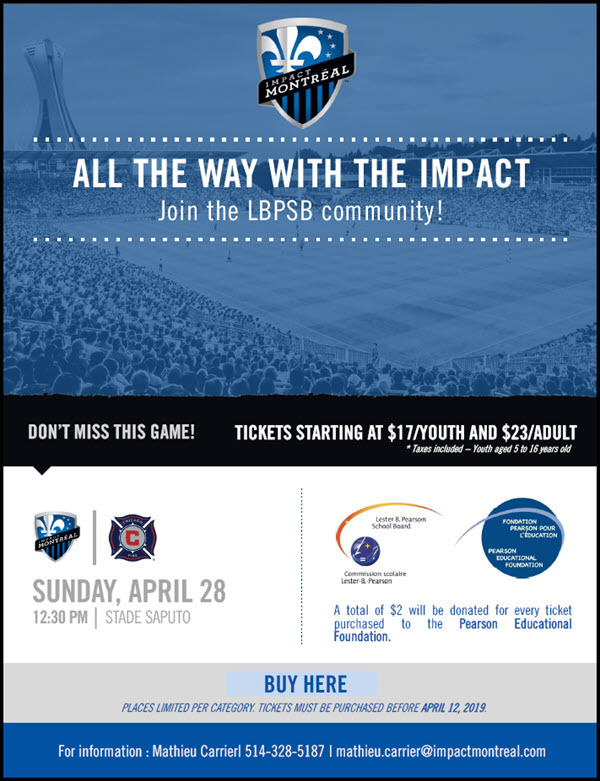 A great opportunity to enjoy an Impact game with family & friends. Click on the graphics below to go online to purchase tickets. When selecting the seats, the price will be at the adult pricing by default. The youth price must be applied at this step of the buying process. 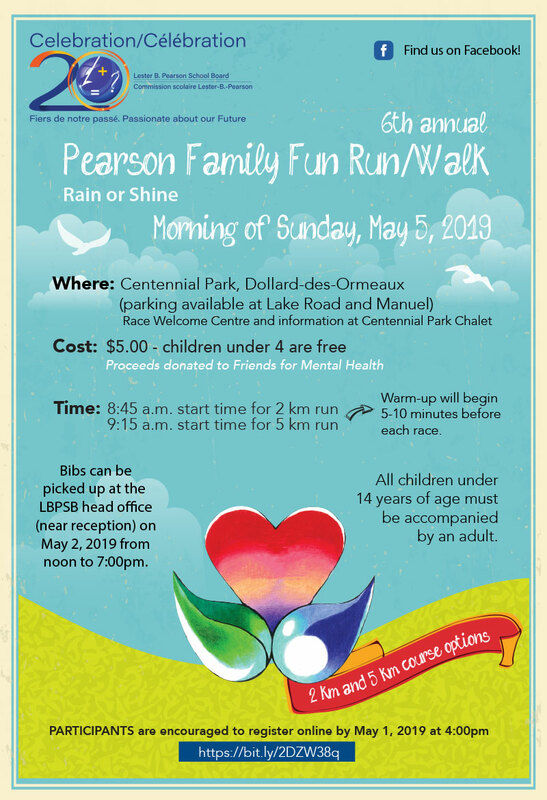 Family Fun Run - Click on the graphic below to buy your tickets now! There are still two evenings left to attend this wonderful production at Lindsay Place High School! 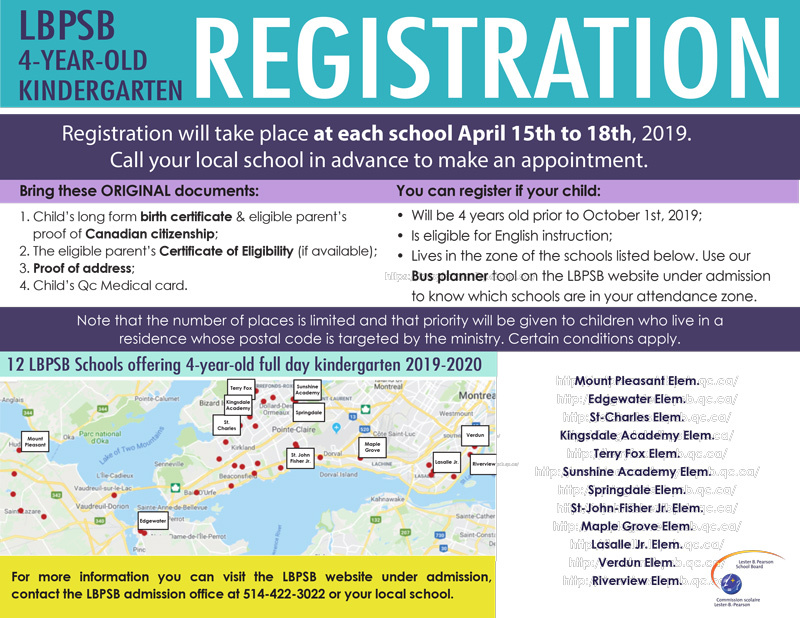 Please note that parents of grade 5 students who ARE enrolled at an LBPSB school can register their child for the secondary enrichment program entrance exam via their Fusion Parental Portal account. The entrance exam will be written on the morning of Friday May 3rd, 2019 at their current elementary school. An ERMS email was sent to all grade 5 parents on Tuesday evening, March 12th regarding the procedure to follow. LCCHS Sonic Howl #3985 and Lakeside LA TECH #4955 competed in the Festival de Robotique over the weekend at the Olympic Stadium and both teams did incredibly well. Lakeside managed to finish in the middle of the pack while LCCHS was a sleeper hit and managed to be picked for the First place alliance along with two other robots from Quebec. After struggling in the preliminaries, Sonic Howl went on a miracle run through out the playoffs and went on to win the Championship going 6-0 , crushing the competition with record breaking high scores each match. In the finals, this intrepid team from Quebec beat out 2 teams from New York and a private Quebec school. With the win, LCCHS Sonic Howl will be officially competing at the World Championships in Detroit April 24th -27th against over 600 teams from all around the world. Link below if you want to watch the final round of the match. 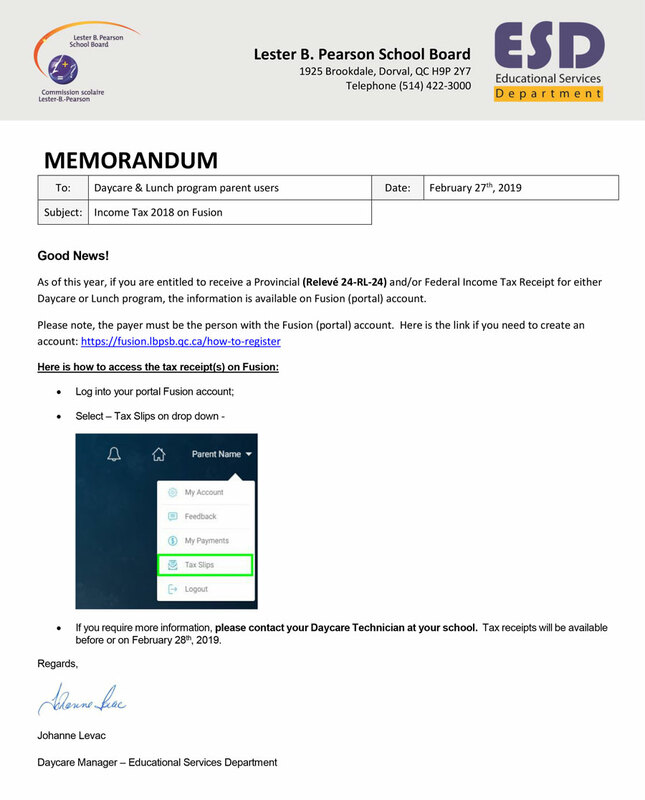 Tax receipts for Daycare & Lunch Programs now available on Fusion! Please read this notice carefully as it may affect your rights. You must act without delay in order to meet the deadlines indicated. Veuillez lire le présent avis attentivement puisqu’il peut concerner vos droits. Vous devez agir sans délai afin de respecter les échéances indiquées. Our newly adopted Vision & Values!